I tell you no porkies, there’s something foul going on in the state of Denmark. Oh sorry, that should be ‘fowl’. Turkey to be more precise. According to an ongoing survey on national broadcaster’s DR’s website, turkey has emerged as a formidable competitor as the preferred choice for Christmas dinners across the country, particularly in southern Denmark. In mid and north-Jutland 12 percent of Danes said they were going for turkey, slightly higher than the 9 and 11 percent in the Capital and Zealand regions, but the big surprise is that more people are going to gobble up a gobbler than traditional roast pork (flæskesteg) in the Southern Denmark Region (20 percent compared to 17). It is unknown why turkey has made such an impression on the Danes, but it is regarded as being a healthier meat than most, and the rising popularity of US traditions such as Halloween, Thanksgiving and even the Superbowl could factor in. 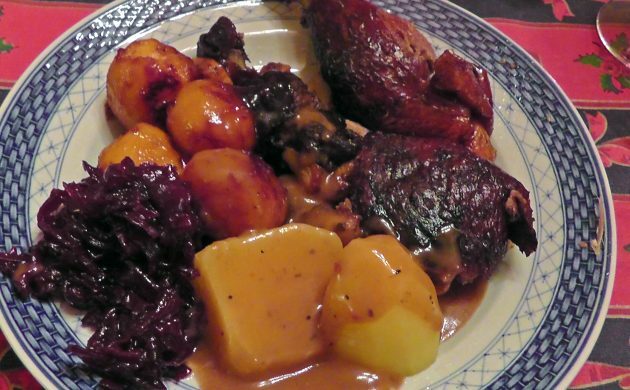 Some things never change though, and the survey confirmed that a commanding 65 percent of Danes will be dining on duck on December 24, followed by flæskesteg with 23 percent and turkey (12 percent). Duck was by far the most popular choice in all five regions of Denmark, ranging from 59 percent in Zealand to 68 percent in mid-Jutland. Flæskesteg, meanwhile, ranged from 17 percent in the Southern Denmark Region to 30 percent in the Zealand Region. The survey also revealed that, from a national perspective, turkey was more popular among the female population compared to men, and the ladies also didn’t dig swine as much as men. One thing they could hopefully all agree on, however, is that the meat should be drowned in a good dose of fingerlickin’-good brown gravy. So far, over 3,000 people have voted on the DR website. Vote and see the results here (in Danish).